In this time we will discuss about how cook Opor Ayam. In fact, the basic ingredients for this food in are inexpensive. The basic ingredients of this one could be made for other food unlike beef. Of course, this food is Favorites menu for family in Indonesia because it has tastes delicious. Many women love these basic components, because it is easily to be cooked and can provide special dishes for their family. Now, please check the following recipes Opor Ayam that can be made for any event and for our family. 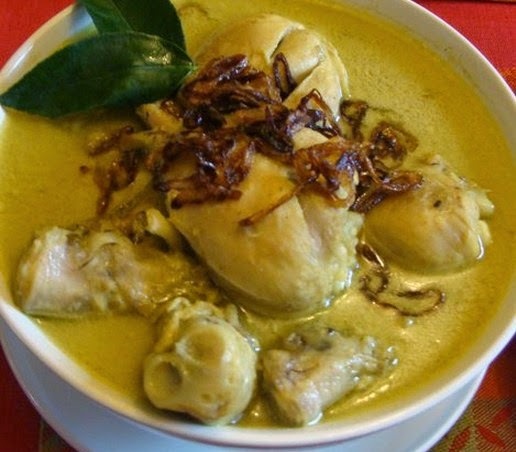 Opor ayam is a popular recipe in Java. It is similar to the curry, but its taste is delicious and aromatic. Besides for dishes, usually Opor ayam as a 'must have' dishes during the largest Muslim holiday that is Eid Fitri in Indonesia. It is usually served with ketupat and other dishes such as fried potatoes. furthermore, this food also great to be served with steamed rice, yellow rice or rice cake. Marinate the chicken with one tsp of sour water and 1 tsp salt. Let it stand for 15 minutes. Grind or a mixture all ingredients of spices. Heat the vegetable oil components fried noodles with lemon, lime and bay leaves left on the high-medium heat until you can smell the fragrant. Then put the chicken and stir it with a little seasoning, then put the water. Add salt and sugar. Cook it until boiling.